When it comes to thinking up great ideas, nature provides a ton of inspiration. A falling apple clued Newton in to gravity. Gliding birds inspired the Wright brothers. And dolphins have provided the inspiration for a new type of radar that might help people detect all kinds of hidden things from skiers buried in snow by an avalanche to roadside bombs in a war zone. Dolphins, often hunt their prey by trapping them in a net of bubbles. They make this net by blowing bubbles as they swim in circles around a school of smaller fish. The bubbles create a sort of screen that the smaller fish won’t swim through. So the school begins to gather into a tight ball inside the circle of bubbles. Then the dolphin charge through the ball snatching up mouthfuls of fish. Of course, the bubbles make it hard for dolphin to see where the fish are, so they use their sonar. They send out a signal that bounces off the fish and lets the dolphin know where they are. The thing is, sonar bounces off bubbles, too. Some British engineers took a look at how dolphins distinguish prey from bubbles by sending out their sonar in twin pulses. The engineers are using that idea to develop a similar technology using radio waves instead of sonar. They say is could help them find certain hidden objects. For instance, it could help them distinguish “clutter” like buried pipes and nails from the electronic devices used in some roadside bombs. The radar device was developed by a team led by Prof Tim Leighton, of the University of Southampton, and scientists from University College, London. This story was adapted from a news story posted by BBC. 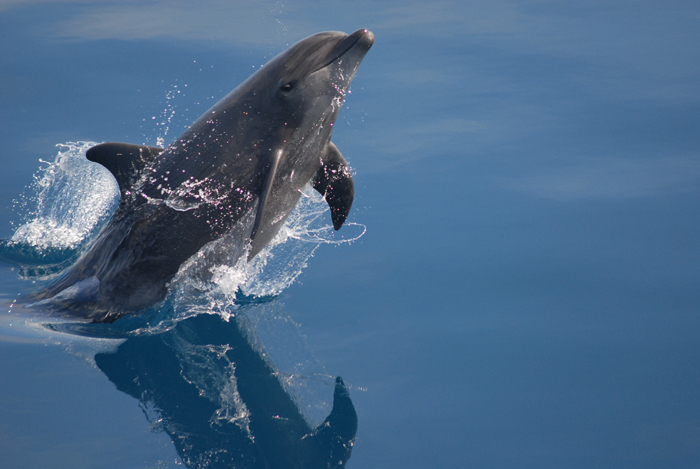 Find out more about how marine mammals are used by the military. ← Isopod Got Your Tongue?